Early care and education providers spend every day helping children learn and grow. Now it’s their turn! For nearly 20 years, the Professional Development Program (PDP) has helped Contra Costa’s child care providers advance their education and training in early childhood education, and rewarded them when they do. 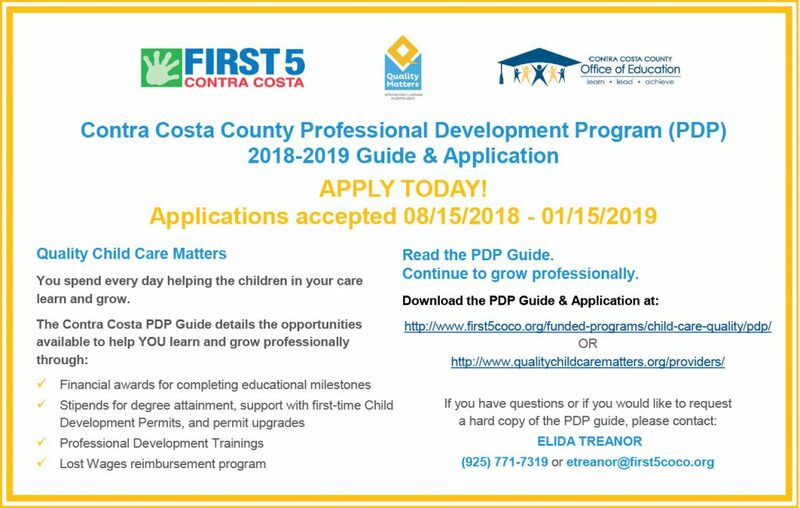 Child care providers working in Contra Costa County with children birth to age five may be eligible for financial incentives ranging from $300 to $1,250 when they earn six units of college coursework, meet education milestones, complete training hours, or qualify for lost wages reimbursements. See the PDP Guide or contact your PDP College Advisor for program information and requirements, a calendar of important dates, and other resources. If you are at a new or returning site, looking for the 2018-2019 Quality Matters Application/Update forms and documents, please click Quality Child Care Matters to be taken to the documents. We award financial incentives to child care providers who meet requirements for advancing their education and training in early childhood education. For participants in state-funded preschools, please see page 13 of the PDP Guide and/or visit Plan 4 Kids for more professional development opportunities.